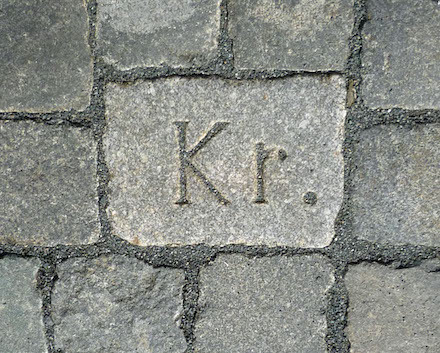 On this date in 1601, former Saxon chancellor Nikolaus Krell/Crell was beheaded in Dresden as a heretic. The “Crypto-Calvinist” movement within Lutheranism was a particularly sore spot in Krell’s own Electorate of Saxony where such exalted figures had already in the 1570s been toppled from proximity to the Elector Augustus by exposure of their Zwinglian sympathies. Krell (English Wikipedia entry | German) would follow a similar rise and downfall. He’d taken a shine to the disfavored doctrines on a youthful sojourn in Switzerland, and evidently carried them with due discretion all the way on his his pinnacle as Elector Christian I‘s chancellor. In this position, Krell made himself unpopular for a variety of policy reasons including but not limited to his promotion of Calvinist-leading ecclesiastes, which would just be all in a day’s work for the Elector’s Hand save that Christian died young and left the Electorate to an eight-year-old son — exposing his former chief minister to the vengeance of his foes. The ensuing regent had Krell clapped in prison almost immediately, although it took years from that point to bring him to trial and finally to the scaffold as the process refracted through the cumbersome imperial bureaucracy. * A notable bone of contention: the purported “Real Presence” (not merely symbolic presence) of Christ in the Eucharist, a Catholic doctrine which Luther also accepted but Zwingli rejected. Felix Platter is our narrator for Guillaume Dalencon’s death at the stake on this date in 1554. This book portrays the 16th century through the remarkable Platter family. Platter (English Wikipedia entry | German) was a 16-year-old Swiss student, and we find him on the midpoint of his family’s upward arc in the world. His father, Thomas, had as a child been put out of the house by his impoverished mother and made his way for a time as a beggar; by dint of lifelong struggle and application, he had gained a precarious foothold among the bourgeoisie of Basel. Thomas Platter nurtured still greater ambitions for his son. Accordingly, the very genial Felix, who had never before traveled, set out in 1552 on the 400-mile journey to the city of Montpellier in southern France. Young Platter was an energetic diarist, and his impressions of the journey and of Montpellier were published in English as Beloved Son Felix. (That’s how Felix’s father addressed him in letters.) Though the book is out of print, it’s available online at archive.org. One of its immediately striking features is the omnipresence of danger and death. Platter luckily left Basel just ahead of a plague outbreak, but he nearly lost his life in the frightening Jurthen forest. Taking shelter from the rain there in “a wretched inn” at a squalid hamlet called Mezieres, Platter and his companion found the place full of aggressive Savoyard peasants, and having no choice but to stay overnight they blockaded their door with a bed and kept a waking vigil all night with weapons at the ready. Three hours before dawn, they crept through the snoring mass of drunken thugs and slipped away, and a good thing it was too: the boys’ French guide told them as they set out that he had overheard the brutes plotting to murder the hapless travelers that morning. The bandit “Long Peter”, who was then active in this forest, was eventually caught and executed on the breaking-wheel in Berne. Only in his old age did Platter learn that the brigand’s confession included a declaration that he had planned, but failed, to kill some students in Mezieres. Platter makes no further comment on this sight, but it must have touched him with pity — if not fear. Platter had been born in Basel about the same time that John Calvin, fleeing French persecution, arrived there; it was in Basel that Calvin first published his seminal theology Institutio Christianae religionis. To this faith, predominant in Swiss cities but illicit in France, Platter too subscribed. The French Wars of Religion loomed around the corner in the next decade, and Montpellier would become a Huguenot stronghold during that conflict. While Platter was there, an uneasy peace prevailed between growing ranks of Protestants and the official religion. 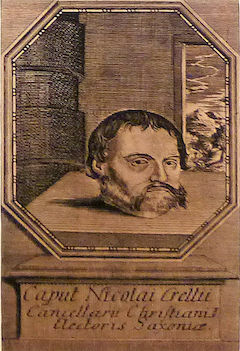 The University of Montpellier attracted numerous Protestant students (the city lay in the heart of the Languedoc, a center of resistance to the papacy from long before the Reformation), and Platter’s own mentor, the brilliant doctor Guillaume Rondelet, had ambiguous religious affiliations. Day to day, these students kept their heads down in matters religious and went about mostly unmolested. Taking a vocal stand on theological controversies here would be to embark upon a different path than Thomas Platter had in mind for his son, for heretics were among the many executions Platter recounts in his journal. Guillaume Dalencon, the boy learned, was a former priest of Mountauban, “unfrocked on the 16th of October” when it was discovered that he had gone Protestant and brought back heretical books from Geneva. “Dressed in his priestly robes, he was brought on to a platform before the bishop” for his defrocking. “After protracted ceremonies in Latin he was divested of his chasuble and the rest, and given secular clothing. Hishead was then shaved, and two fingers were cut off his hand. After this he was delivered to the civil justice and once more thrown into prison.” The secular power took it from there. On the 6th of January Guillaume Dalencon, unfrocked eleven weeks before, and since then held in prison, was condemned to death. In the afternoon a man carried him on his shoulders out of the town towards the monastery, to the place of execution. A pyre had already been built there. Beind the condemned man two other prisoners walked, one a cloth shearer, in his shirt, with a bale of straw fastened to his back; the other of good appearance, and well dressed. Both of them had recanted and denied the true faith. [i.e., both had recanted Protestantism under the threat of execution. -ed.] Dalencon, however, sang psalms all the way. At he pyre, he sat down on a log and himself took off his clothes as far as his shirt, and arranged them beside him tidily, as though he would be putting them on again. He exhorted the other two, who were about to apostasize, so touchingly that the sweat stood out in great drops, as big as peas, on the forehead of the man in the shirt. When the monks, formed in a curve around him, and mounted on horseback, told him that it was time to make an end, he leapt joyously on to the pyre and sat down at the foot of the stake that rose in the center of it. This stake was pierced by a hole, through which ran a cord with a running noose. The executioner put the cord round Dalencon’s neck, tied his hands across his breast, and placed near him the religious books he had brought from Geneva. Then he set fire to the pyre. The martyr remained seated, calm and resigned, with his eyes raised towards heaven. When the fire reached the books the executioner pulled on the cord and strangled him; his head dropped to his breast and he made no further movement. Little by little the body was reduced to cinders. His two companions stood at the foot of the fire, where they were made to watch his sufferings, and could feel the heat of the flame. 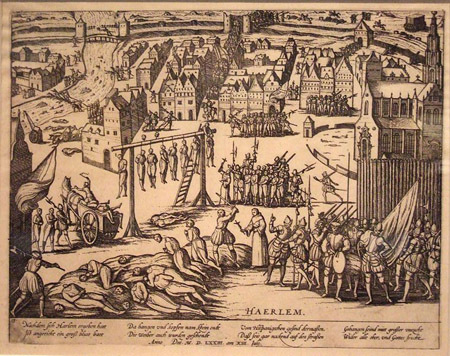 After the execution they were both taken to the Hotel de Ville. Near there, in front of the church of Notre-Dame, a platform had been set up, with a statue of the Virgin on it, before which they would have to recant. The crowd had to wait for them for a long time. At last only one of the two men was brought out. The cloth shearer had refused to abjure and demanded that he should be executed without mercy for having failed his beliefs. He was therefore taken back to prison. The other man, who seemed to be a man of substance, was placed on his knees before the statue of the Virgin, with a lighted candle in his hand. A clerk read out various charges, to which he had to reply. In this way he saved his life, but he was sent to the galleys and there put in chains. On the following Tuesday, the 9th of January, it was the turn of the cloth shearer again. He was strangled and burnt as the priest had been. He showed great courage, and no less repentance for having come so near to denying his faith. It had rained on that day, and the fire would not burn. The victim, who was not completely strangled, endured great suffering. At last the monks of the neighbouring monastery brought some straw, and the executioner took it and sent for oil of terebinth from my master’s pharmacy to ignite the fire. Afterwards I reproached the assistants who had given it to him, but they advised me to hold my tongue, for the same fate could befall me also, as a heretic. During these affairs an extraordinary phenomenon occurred. On the 6th of January, immediately after the execution of the first man, it began to thunder violently. I heard it plainly and so did many others with me; but the priests deried us and said that it was the smoke from the burning of heretics that produced that effect. 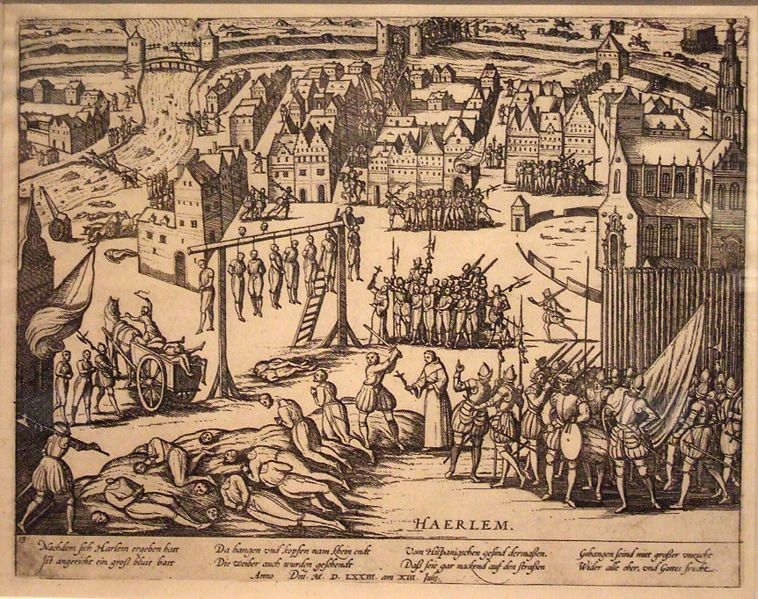 On this date in 1573, Wigbolt Ripperda was beheaded in Haarlem’s Grote Markt for having led a stubborn seven-month resistance to a Spanish siege. Ripperda had been a Calvinist with a hand in the iconoclastic spasm against Catholic churches that had led to the beheadings of Counts Egmont and Hoorn a few years prior. In the intervening years, relations between the Low Countries and the Spanish crown that ruled them had deteriorated into outright revolt — the germ of the decades-long struggle that would result in Dutch independence. Haarlem had initially tried to keep its head down in the conflict, but had declared against Spain in 1572. That brought it into the sights of a vengeful Spanish army that greatly outnumbered Haarlem’s 4,000 defenders. Spurning any talk of compromise or capitulation, city governor Ripperda rallied his garrison and held out against the Spanish siege throughout the winter and spring. Ripperda was beheaded with a lieutenant a few days later, but in winning the battle, Spain had suffered a setback in the war: besides the seven-month delay, other Calvinist strongholds took heart from the effective resistance and got a lot less cowed by the royal army. While this day’s martyrdom made “Ripperda” a fixture in Haarlem place names, and despite a somewhat illustrious family tree that also includes a signatory of the Peace of Munster and a fascinatingly disreputable 18th century politician, actual Ripperdas are apparently hard to find in present-day Holland. According to American Tom Ripperda, who runs the family site ripperda.org, the name lives on only in the U.S. and Germany. * As to the vengeful mass executions visited on Haarlem, John Lothrop Motley conveys this anecdote. Instead of Peter Hasselaer, a young officer who had displayed remarkable bravery throughout the siege, the Spaniards by mistake arrested his cousin Nicholas. 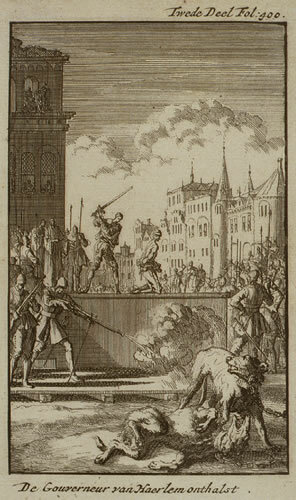 The prisoner was suffering himself to be led away to the inevitable scaffold without remonstrance, when Peter Hasselaer pushed his way violently through the ranks of the captors. “If you want Ensign Hasselaer, I am the man. Let this innocent person depart,” he cried. Before the sun set his head had fallen. On this date in 1559, Protestant parliamentarian Anne du Bourg was publicly strung up and burned for his uncompromising defense of Calvinism. All France burned, figuratively, with the Protestant Reformation — and literally, with Henri II‘s ruthless reaction against it. But that flame tempered and honed the Huguenots’ steel. Incensed, the king had du Bourg and others of the “moderate” party arrested in Parlement and drug to the dungeon. And though his compatriots were satisfied to recant what imperiled them, du Bourg remained obdurate and even provocative, smuggling a pamphlet against the monarch out of prison.